There are so many benefits we gain from having lawns that there simply is no question as to their worth for all of us. But good lawn care also includes regular lawn mowing routines to maintain our lawns at optimum health and beauty. The end product of all this lawn mowing throughout the year is an abundance of lawn clipping which then need to be disposed of. Disposing of lawn clippings can be a costly exercise even though we may not be immediately aware of it’s true expense. But lets stop and think about all those millions and millions of acres of lawns around the country, all being mowed regularly. This produces an enormous amount of waste material which then must be disposed of in rubbish trucks and into land fills. The question we must all ask ourselves is if all of that energy and manpower is really necessary to rid ourselves of this natural by-product, and with all the environmental benefits produced by lawns – are we undoing it all through the disposal of our lawn clippings? Well, the overwhelming answer to this question is yes… yes we are undoing a great deal of the environmental benefits our lawn produce by these waste disposal practices. So how can we recycle these lawn clippings and exactly what is in lawn clippings that could be used for something else? Lawn clippings hold around 75% of their weight in water alone, so if we imagine a 4 ton truck full of lawn clippings, the truck is actually carting 3 tons of water! This is a purely wasteful exercise, in both energy and manpower expenses. The rest of the lawn clippings are made of simple fibers and are full of nutrients that lawns and soils love and thrive on, so the natural use of these clippings would be to use them for a perfect purpose they are naturally made for. Which is to return them straight back into our lawns and / or soils and let them release all their nutrients and goodness for the benefit of our gardens, and to bypass the rubbish trucks and all the associated pollution and wastefulness they involve altogether. There are three main ways to recycle lawn clippings, and each home and lawn may require a different method recycling, or even a mix of all three methods. The choice is entirely up to the homeowner, so lets take a look at all three methods. This method involves mowing our lawns without a catcher, and leaving the clippings on the lawn to break down and deteriorate their nutrients straight back into the lawn. This is a great method for recycling lawn clippings and it doesn’t get any easier. The greatest result from using this method is to ensure lawns are mowed regularly so the clippings are as small as possible, which then break down much quicker. Another way to ensure the clippings are as small as possible is to use a lawn mower with a mulching plug, these lawn mowers have 4 blades and the mulching system spins the clippings through the lawn mower blades many more times to finely chop up the leaf material. If you own a compost pile, then you’re likely to already be utilizing this valuable resource in your compost, lawn clippings are the raw fuel which fires up the composting process, and they break down to create a wonderful nutrient rich compost for use on all gardens. If you don’t already own a compost pile, then you really are missing out on one the greatest resources possible to create a fantastic soil for your entire garden and the plants they contain. Compost will greatly reduce or eliminate the need for many garden fertilizers, and reduce the need for any purchase of extra soils to supplement or boost the nutrient profile in the soils of your garden, reducing even more trips to the garden and landscape yard. Composting is also a great way to use all those leaves, small twigs and other garden waste and kitchen waste in the best way possible – which is to create a beautiful healthy garden. And best of all, the cost of gaining a wonderfully rich and beautiful garden using this method is…. free! 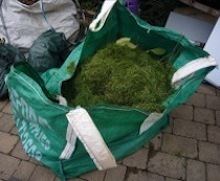 The final method of recycling lawn clippings is to dig them straight into the garden bed, this can be a great choice for when gardens are limited in the plants they contain. To do this properly, the clippings will have to be really dung into the soil with a spade. mixing the soil and lawn clippings together. This allows the micro-organisms in the soil to reach all the lawn clippings and begin feeding on all the nutrients they contain which can then be returned to the soil. It is important when using this method that lawn clipping aren’t just left to sit on top of the garden bed, because they will not break down because they are not surrounded by the micro-organisms from the soil which actually break them down. Clippings left on top of the garden bed can also create a water proof layer which will allow water to run off the garden bed without being absorbed. It is also important not to just dig a hole and put the clippings inside and then cover it up, this only creates a big clump of clippings which is also isolated from the important soil micro-organisms, doing this can cause the clippings to take years to break down instead of weeks. Mowing lawns to many people seems like little more than a tedious chore which is constantly needing attention, the grass is getting out of control, which makes the home look messy, and it’s just another job we need to do regularly. For the Lawn Care Professional however, he or she can share with you just how important mowing a lawn really is to so many factors of lawn care. This simple task, if done correctly contributes to not only a clean finish to the turf itself but helps it’s health, prevents weeds from taking hold or reproducing, and helps keep lawn diseases under control. When we begin discussing how often to mow lawns, one of the most important factors to consider is that we need to mow it regularly enough so that excess thatch doesn’t occur in between mowings, which would result in a lawn being scalped when too much leaf material is removed in any single lawn mowing service. When grass gets too long between cuts, the crowns of the lawn also raise up higher, the brown thatch layer raises higher, and the section of the lawns leaf which is actually the green part we like and use as our lawns also raises up higher. The problem is that when we then mow an overgrown lawn back to a regular and normal height, we risk cutting off all the green leaf which stops photosynthesis and food production to the lawn, we reveal the brown thatch layer, which is just plain ugly, and we risk cutting off the crowns of the lawn, which will result in the death of the lawn in the section affected. When choosing a mowing frequency for your own lawn, we need to aim for removing the least amount of green leaf in each mowing down to a minimum. The most recommended amount of leaf material to remove in a single mowing is never to remove more than 1/3 of the green leaf at any lawn mowing service. While the warmer weather will require more regular lawn mowing and as the seasons cool, lawn mowing regularity decreases. If you’re new to lawn care or have moved to a new region, or have a new grass type, the best place to begin with choosing a lawn service routine is to check on what your neighbors are doing with their own lawn mowing frequencies. Check the properties which have the best lawns and are the same grass type as your own, and then take note how often it is being mowed, or simply just begin copying the neighbors lawn mowing routine and mow your own lawn as soon as you see his or her lawn freshly cut, and you’ll soon develop your own sense and routine of lawn mowing regularity for optimum lawn health. Mowing heights vary greatly depending on many factors, and in choosing the mowing height which is right for our own lawn it’s important to remember that mowing our lawn at the correct height not only keeps it looking great and in optimum health, the correct height is vital in not damaging or even killing the very lawns we’re tending to with such great care. Generally speaking and as a basis for this article on lawn mowing heights, the first factors to consider are what grass type you have, and which region you live in. Grasses are divided into 2 categories, there is the Warm Season grasses which include Bermuda Grass, Zoysia Grass and Saint Augustine, and then there are the Cool Season Grasses which include grass types such as Ryegrass and Fescues. These two grass type categories are easily determined as to where they are best grown, i.e. Cool Season Grasses are best grown in cooler climates, and the Warm Season Grasses are best suited to the warmer regions. Generally speaking, the Cool Season grasses will need to be maintained at a very high height, anywhere between 3 to 6 inches long, some lawn varieties will prefer a high leaf while others will prefer a shorter leaf length. Where Warm Season Grasses differ again is that they can be cut at a much lower height, many varieties such as Bermuda Grass or Zoysia can be cut as low as half an inch if in a very warm climate and if it is well maintained. Although half an inch is not the optimum height for the average home lawn, we use this as an example to compare the differences between the two categories of turf, the Warm and Cool Season grasses. For Warm Season Grasses, the better height for the homeowner may be between 1 to 2 inches, some of the newer soft leaf Saint Augustine lawns even look great with a nice long leaf up to 3 inches. Another important factor when choosing the correct lawn mowing height for your lawn is to also judge the amount of direct sunlight it receives each day, and alternately, how much shade it is subjected to each day too. Another general rule of thumb for lawn mowing heights is that the more shade a lawn is subjected to during the day – the longer the leaf blade will need to be in order to keep the lawn flourishing. This is because it’s the green leaf which creates the photosynthesis process which uses sunlight to make it’s food supply, lawn will need more green leaf in the shade in order to get the same level of food as a low cut lawn which is sitting in full sun. This same rule also applies in reverse, if a lawn is situated in full sun all day, it’s leaf must be maintained at a lower height in order to reduce it’s photosynthesis process, otherwise the lawn will produce too much food and will grow too fast. Which in turn increases thatch build up much faster and will require far more regular lawn mowing. Often we can come across an overgrown lawn which we are tasked to bring under control. There can be many reasons for this, perhaps we’ve started looking after the alwn for a neighbor or friend, or we’ve moved into a new house, or perhaps we’ve just been so busy lately that the lawn has paid the price for our hectic lifestyle and been neglected for some time. Whatever the reason, we now have an overgrown lawn to deal with, for the novice it may just seem like a case of getting the lawn mower out of the garden shed, lowering the cutting height to the ideal we would like it at, and begin cutting. Unfortunately this can often be the worst thing of all to do as it can severely injure or even kill the lawn in a single mowing. The reason for the damage occurring is that an overgrown lawn has not only raised it’s overall height, it has also raised the brown thatch layer and the crowns of the lawn as well. If the lawn is now cut too short, the lawn mowing process may remove all the green leaf, which will then stop the photosynthesis process which supplies the lawn with it’s only method of converting it’s food source, which means the lawn may then die or severely struggle for a long time to recover. If the crowns of the lawn were removed during the mowing, then the entire lawn in the affected area will die off completely, this is because all the runners, thatch and green leaf all emerge from the crowns, with the crown gone – there is no possible way for the lawn to survivi in the affected area. In knowing these important factors in mowing long grass, the solution and process is now more easily seen. The answer and the only correct method to cut long grass and to keep it maintained at a lower and more desirable height over the long term is to reduce the height of the lawn in stages. Beginning with the first lawn mowing, we only want to remove about a third of the green leaf. Sure, I can here people saying that the lawn will not look that crash hot once it’s first cut, and that is TRUE. However, the more important factor is that the lawn will remain ALIVE. At the second lawn mowing, we can reduce the height a little bit more, and so the process continues until we eventually reach the desired height we want to achieve. The gradual lowering process of the mowing height guarantees the lawn stays alive, stays healthy, and at each mowing will gradually begin looking better and better at every lawn service until we have achieved the ultimate result. As the process of lowering the height of the lawn continues, the crowns and thatch layer of the lawn will also adjust themselves and lower themselves down to their optimum height. The best time to use this process to lower heights of lawns is during the active growing seasons for our lawns which is during the Spring, Summer and early Fall months of the year. This is important because if the lawn is not actively growing, it cannot actively be repairing itself as the lawn repair is being undertaken. So the process will not work. If you need to tackle a lawn which is overgrown and the weather is cooler, then the best option may be to keep the lawn mowed at a higher height until the next growing season arrives in the Spring.